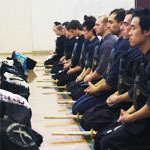 Welcome to Shidokan Kendo and Iaido Club! 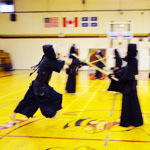 The purpose of Shidokan is to teach Japanese swordsmanship, its physical techniques and spirit, through the practice of kendo and iaido. 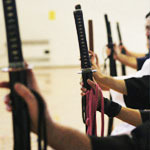 The practice of kendo and iaido is instructed and conducted solely by Sensei(s) the instructors: Mr. Santoso Hanitijo, Mr Robert Miller, Mr Dean Jolly & Senior students appointed by them. All students must trust this leadership, and heed the teachings and instructions no matter what, without confrontation or reply, as it would be performed in a Militia Chain of Command . Students must respect each other and must not cause any personal discord. Students must not bring disgrace to Shidokan or to its fellow members. Any one who goes against the above mentioned rules would be the subject of suspension or expulsion from the dojo. Proper etiquette must always be displayed in a friendly and respectable manner towards Sensei (instructor) , Sempai (senior students) and every other member of the club. Pejorative terms such as 'insults', 'racial slurs', 'swear words' and any other type of physical or verbal aggression will not be tolerated at the dojo. Punctuality : Please be ready 15 minutes ahead of the practice start time. This is to ensure that there is enough time to change and to help with the practice area clean-up. What To Wear: For the first several lessons, please wear loose clothing such as a plain T-shirt and shorts or appropriate athletic pants. 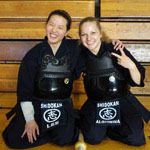 Kendo & iaido require sliding footwork technique so pants that are too long will not be appropriate (make sure the pants don't drag around the floor). 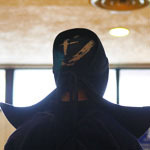 You will be expected to purchase a kendo (or iaido) uniform by the end of the first semester.  Shinai (Kendo) / Bokuto (Iaido) : New students are allowed to borrow the kendo club’s shinai or bokuto for the first two weeks of practice. Afterwards, it is expected that each student will purchase their own shinai or bokuto. This is your “sword” so it is important to have and to take care of your own. 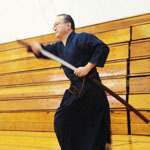 The kendo club does sell the shinai, but the student may purchase it from anywhere. However, please confirm what size shinai should be purchased if you decide to buy your own from somewhere else. Proper Manners/Etiquette : The dojo is a place of respect; for the dojo space itself, your fellow students and for yourself. Please bow into the dojo space when entering or leaving. Please greet other students and sensei (instructors) clearly and politely. The shinai is your “sword” and as such, it must also be treated respectfully and not as a walking stick or a bat. 一 Reigi: When entering and leaving the Dojo make a deep and reverent bow. 二 Do not enter the Dojo untidily dressed; if dressed in Japanese style, a Hakama must be worn. 三 Maintain a respectful attitude and the most correct posture. 四 Be quiet and conscientious; do not engage in noisy chatter, laughter, clapping of hands, or cheering. 五 After eating, allow a suitable amount of time to elapse before training. 六 If you have taken alcohol do not enter the Dojo, let alone engage in training. 七 The sword is one’s soul, the Bogu is one’s armor; handle them with respect according to the correct method. 八 The Dojo interior must be kept clean and tidy. 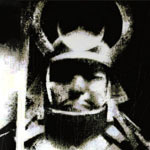 九 Do not comment on other styles of swordsmanship or in each other’s technique. 十 For those who are training in swordsmanship, take caution against shortness of temper or selfishness; do not be quarrelsome, but always remain serene of heart.